The Capita Space Metal Fantasy has been around for a while and it’s a flat between the feet to a rocker in the tip/tail. 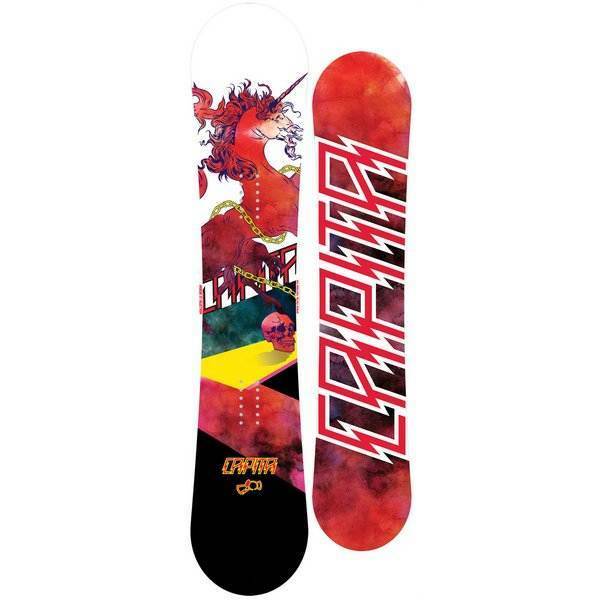 It offers up a pretty buttery jib friendly ride at a pretty reasonable price. 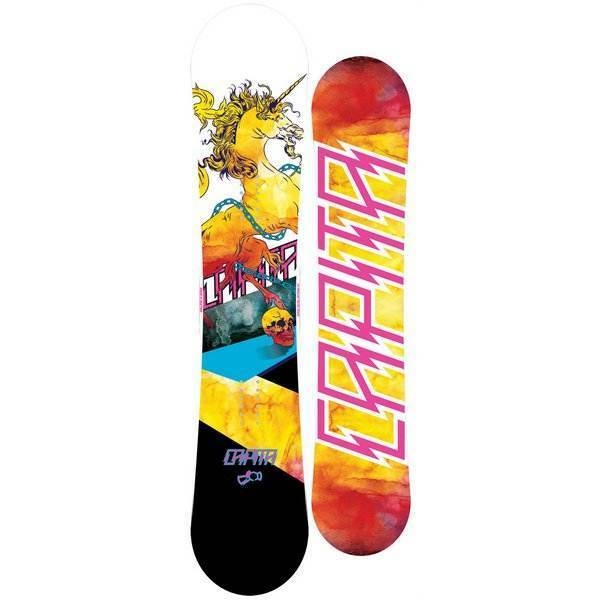 It’s very similar to the Men’s Capita Horrorscope that all the guys loved. Steph liked it as well even though this wasn’t the ideal size for her. 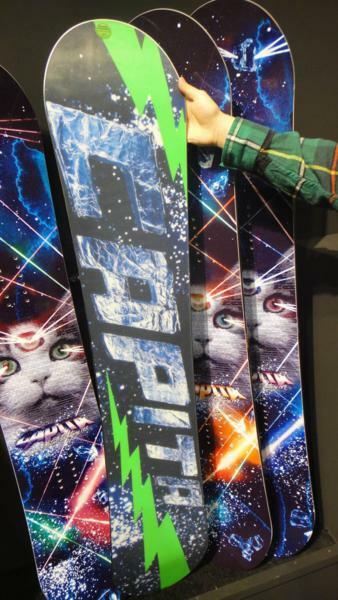 The 2019 Space Metal Fantasy has a slightly different extruded base than the 2018 but other than that the board rides almost exactly the same. Conditions: Mainly good spring conditions. On Snow Feel: Nice stable feel between the feet for one footing and flat basing. Typical flat to rocker feel to it that many like. Edge Hold: Missing the edge hold that most of us really appreciate in harder conditions but it’s not really a board to grip. It’s more of a board to slide so not a real big deal. Flex: Pretty soft and easy. For the last few years it’s got even better with all the new tech from the core, resin, fiberglass, sidewalls and top sheet. So even though the Capita Space Metal Fantasy has the same shape and specs as past models it’s got a completely new personality underfoot. It’s softer but just as damp and a more dynamic/playful than the earlier models. Turn Initiation: The Space Metal Fantasy is a pretty quick turner. It’s sizing runs on the smaller side so you might expect it to turn faster but it feels pretty stable and not that twitchy for it’s size. it’s not a dynamic turner like the Paradise Falls but it’s ok for a flat to rocker board. Turning Experience: Pretty boring for those that really enjoy a good turn but that’s not why you get a board like this. You get this to butter and jib. Skidded Turns: Very easy to skid/slide all over the mountain. Carving: Not a good carver and if that’s what you are more into then it’s more about the Paradise falls. Powder: Because this is a small jib board it’s not ideal in powder but it floats well for it’s size. Speed: Not a mountain board really. You can do it and it’s ok but it’s much more at home in the park. Uneven Terrain: Capita boards are light and snappy but can often have an unforgiving feel underfoot in hard uneven snow. Luckily this is softer and flexier so it’s better than some as long as you take it slow and turn through the bumps. Switch: Almost as good as it gets switch. Only an Asymmetrical Twin would be better. Jibbing: If you buy the Space Metal Fantasy this would be the reason. 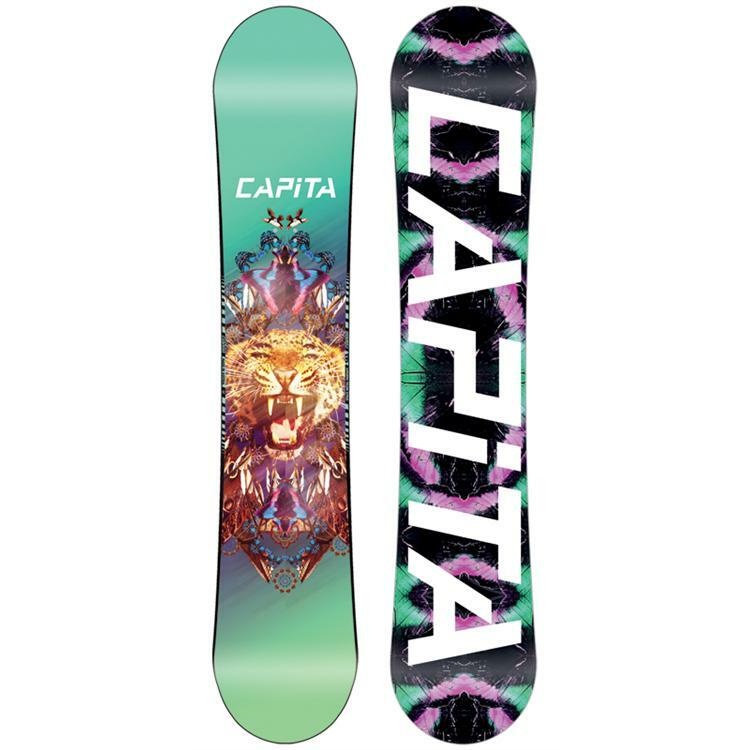 It’s the best jib board Capita makes and one of the better women’s jib boards out there on the market. It’s the kind of board that makes you better at any level. Pipe: Not ideal for the pipe. The Paradise Falls will be a better option there. So all in all Jibbing is all you think about then the Space Metal Fantasy would be a good call. Especially for the price. 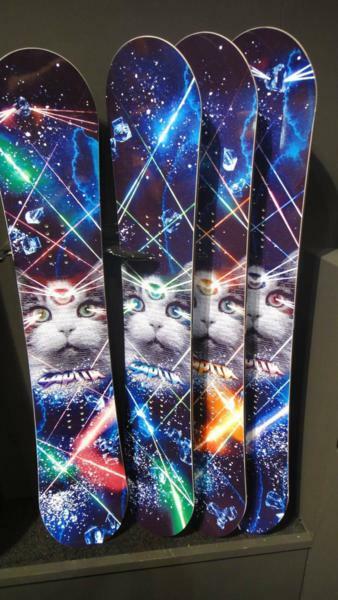 The Space Metal Fantasy’s riding style is jib specific board that isn’t bad elsewhere. 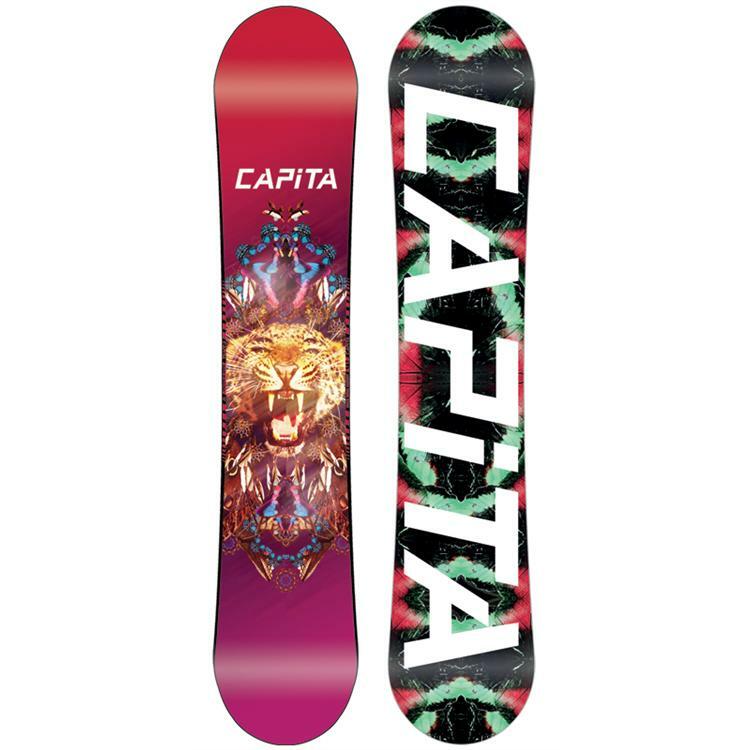 Capita’s camber profile is a little flat section between the feet and then points up at around the bindings. It doesn’t rocker but just points from the new angle which is kind of unique. That is why they call it flat kick. 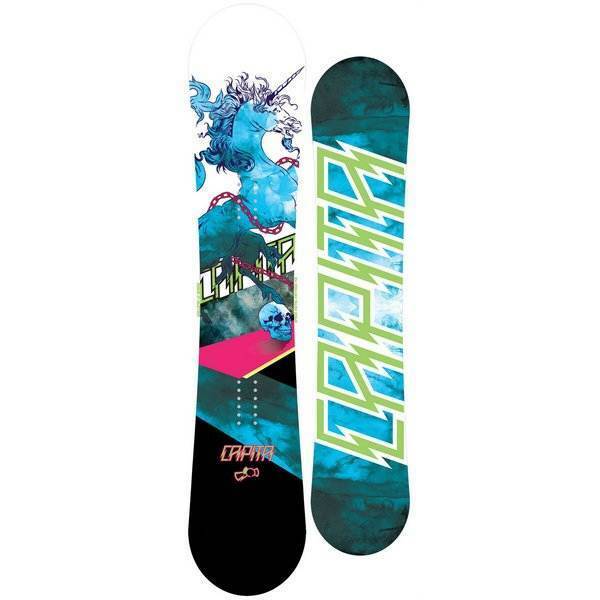 This tech is pretty stable between the feet, easy to one foot and easy to flat base but it can be bit loose at times. 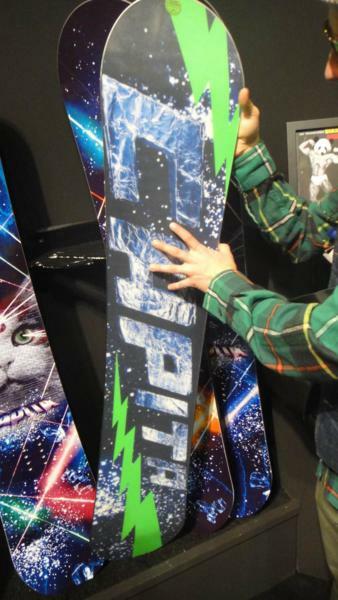 It’s similar to a mostly rocker hybrid camber snowboard. The Space Metal Fantasy has an extruded base that is sturdy and requires less maintenance but it’s slower than a sintered base. If you can get over the extruded base (many can) then you will be pretty happy with the Space Metal Fantasy for mostly jibbing and some ocasional additional park play. For 2012 the effective edge was shortened up which means a little less contact with the snow. The 2013 and 2014 is pretty similar. 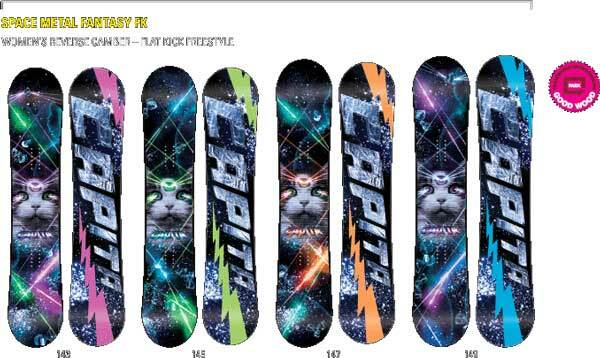 We try to get as many images of the Capita Space Metal Fantasy, but forgive us if they're not all there. Not ideal if you are on a mountain with a lot of ice and moguls or a teacher but a great ride overall. you skid quite a bit and the carving is not spectacular but quick turns and spring snow it is great!